The Bhubaneswar Smart City Plan redefines the concept of "smart cities" and outlines a citizen-driven vision for the future by using technology to help residents gain better access to city services, and improve the overall quality of life. The goal was to engage residents in discussions to identify which groups had access to technology and city services and which groups did not, and how to close that gap. With more than 1 million residents living within 27,000 acres in Bhubaneswar, India, the challenge was to reach as many residents as possible within four months. Created on behalf of the Bhubaneswar Municipal Corporation by Toronto-based IBI Group's India operations in collaboration with Jones Long LaSalle (JLL India), the Bhubaneswar Smart City Plan proposes a state-of-the-art Intelligent City Operations and Management Center (ICOMC) that integrates multiple city systems, including traffic management, parking, bus/transit operations, smart utilities and emergency response. 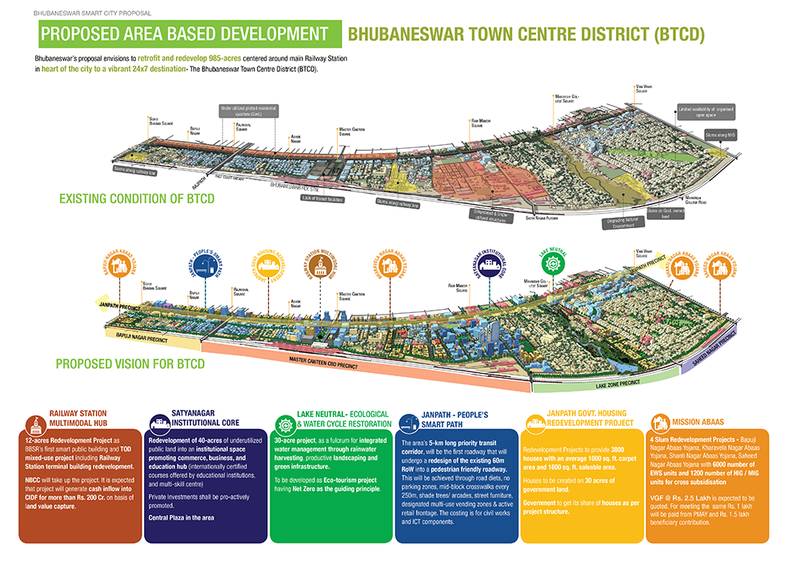 The plan also calls for the redevelopment of 985 acres around the centrally-located transit station into a vibrant 24/7 destination called the Bhubaneswar Town Center District. Together, these centers would provide the foundation for a more inclusive, resource-efficient and technology-enabled city. The ICOMC is designed to address the high prevalence of cash transactions by continuing with cash options and issuing paper tickets with handheld electronic devices until the acceptability of cashless transactions improves. To encourage a sense of ownership, the "I Support My City" project, rewards individuals for living more responsibly, such as using public transit or segregating. 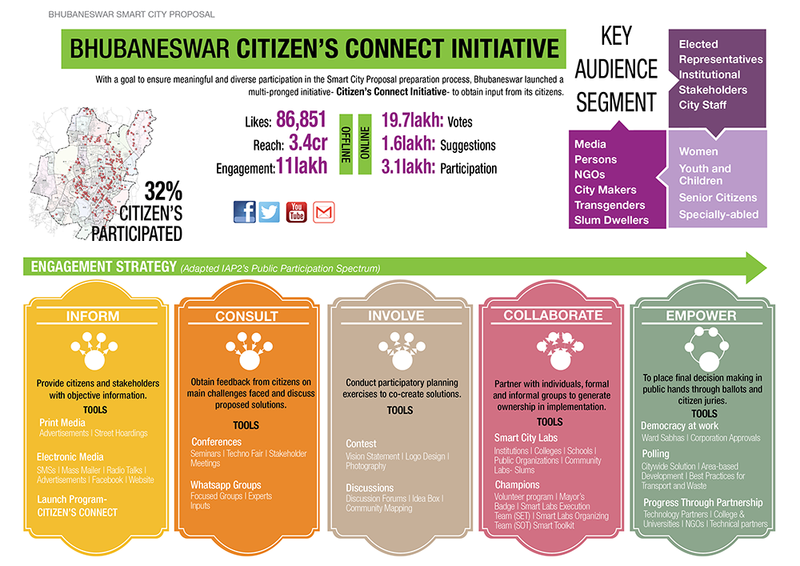 Bhubaneswar launched Citizens Connect Initiative, a multi-pronged public outreach effort to encourage meaningful and diverse participation in the proposal development process. Graphic courtesy IBI Group. The city of Bhubaneswar launched several initiatives to improve public outreach and create a dialogue with residents. Citizens Connect was a three-month project that obtained input from nearly one-third of the city's residents using diverse channels online and offline, including discussion forums and face-to-face meetings with slum dwellers and street vendors, online polls, social media outreach, volunteer programs, idea papers and design competitions. Youth engagement was achieved through street plays, flash mobs and informational kiosks. Smart City Learning Labs, led by moderators, helped initiate community dialogues and engaged workers in local businesses and industries. Public personalities joined as campaign ambassadors. 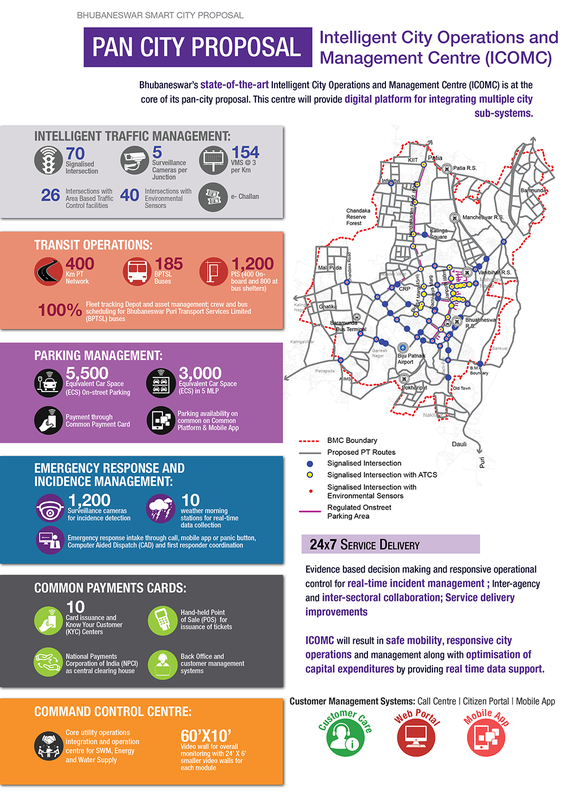 The Pan-City proposal outlines the state-of-the-art Intelligent City Operations and Management Centre, which serves to integrate multiple city transit systems. Graphic courtesy IBI Group. One of the plan's key goals is convert Bhubaneswar into a "child-friendly city." Many of the programs within the plan focus on providing children with equal and abundant opportunities in the city to learn, play, maintain good health, and seek opportunities for growth and development. To address the issue of employability, several skills development centers and Micro-business incubators were created to help residents become better prepared to obtain jobs or open their own businesses. The plan also proposes to formalize the informal sector by empowering marginalized sections of society, including slum dwellers, by awarding them property rights. Slum redevelopments would focus on improving basic services and providing opportunities to improve health and nutrition. The city of Bhubaneswar streamlined systems and implemented technology to operate more efficiently. For example, one government agency was set up to serve as a single point of contact to handle project development, procurement, infrastructure, utilities' management and services. The city also implemented the use of service contracts to procure and track projects more easily, treating them as services rather than physical assets. The proposed plan calls for the retrofitting and redevelopment of 985 acres around the city's railway station to create a vibrant 24/7 destination — the Bhubaneswar Town Centre District. Graphic courtesy IBI Group.